Vital Link can fabricate products ranging in size from small, intricate pieces to large weldments and fabricated structures. We have specialized welding machines and fixturing equipment necessary to perform the fabrication of test fixtures and structures needed for your project. Most importantly, we have the certified welders and boiler/tank piping fitters to perform your work properly. 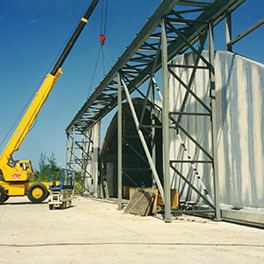 VLI has 3 High Shop Bays and numerous Cranes and Lifts for moving large fabricated structures. We offer complete material origin tracking to assure all products are fabricated with proper material and processes. Much modernization is underway at Vital Link following our joining Atec in early 2017. Energy and Industrial workloads are now reinvigorated, complementing our aerodefense activity. Now joined with Atec, Celtech and Hager, our total machining capability is hugely expanded to include multi axis CNC mills, lathes, waterjets, 3D printers and more. Vital Link’s large scale fabrication capabilities have increased the Atec Companies’ production capacities and field services. • 50 Acres on 4 Campuses w 250,000 sq. ft.